The automotive industry was dealt a real blow last week when Volkswagen announced that they had included software in their engine management system to beat emissions tests. If you set a standard, then no matter what the industry is you will see manufacturers do their utmost to meet or surpass it. Almost anything goes when it comes to generating sales literature and advertisements that will sell a product. Fact or fiction? The UPS industry itself is not immune to similar practices and perhaps no more so than with datacentre UPS efficiency. UPS systems are critical power components within any IT facility, small server and comms rooms to large co-location datacentres. The larger the uninterruptible power supply, the greater the amount of electrical energy running through it. The higher the efficiency, the lower the running costs and additional heat for the local cooling system to manage. UPS manufacturers want to be seen to offer the highest possible energy efficiencies. Sometimes these are at a trade-off. Eco mode UPS operation for example provides a lower level of resilience than on-line mode. Eco mode is more energy efficient (up to 99%) because parts of the UPS system are not active and only come ‘on-line’ when the mains power supply fails or deviates wildly. Whether you run your UPS in Eco mode is very much dependent upon your site and it’s power quality history. You may also take into account time of year and whether there are any local construction projects on-site or nearby which could disrupt your power supply. Whilst Eco mode sounds like a great idea, I don’t like trading efficiency for resilience. Power resilience is what a UPS system is all about and even more so in a datacentre environment. Whilst in on-line mode the UPS is providing the most secure level of power protection it can. Power quality is guaranteed as the inverter is constantly connected to the load. If the mains power supply fails, the battery supplies the inverter. If the UPS is overloaded or has an internal fault, the built-in static transfer will take the load seamlessly to the mains supply. The design is fault tolerant. This is a typical mono-block UPS design and one that has been the traditional mainstay of the industry whether it is protecting datacentre or industrial applications. UPS manufacturers have ploughed millions into raising the efficiency of mono-block UPS designs. Whilst Eco mode will achieve up to 99% efficiency, most mono-block systems will now achieve up to 95% or greater in on-line mode and over a low loading and utilization profile (from 25-100%). Add another UPS in parallel to give N+1 resilience or operate a true modular UPS system and power to your site is secure. Further levels of redundancy can be added: N+2, separate A an B supplies, N+X generators and so on. What limits you in the end is budget and practicalities but a highly resilient critical power supply and distribution can be achieved. However, as with a Volkswagen can you trust the figures? Well that’s the rub. There is no industry standard for efficiency testing. Each country may have their own efficiency programs such as the Energy Star in the US or the Carbon Trust’s Energy Technology List in the UK. However, there may be no audit process of the UPS manufacturer’s submitted test results. The ‘standard’ relies on self-policed data or the threat of an audit by the body running the scheme. This means it is open to some manipulation. The key to achieving a high efficiency eco UPS installation with the right level of resilience and critical power protection is to work with an established company, like EcoPowerSupplies. For any given installation we select the best possible solution based on the level of resilience and efficiency levels specified for your Tier-rated installation. From our monitoring of key installations and the results from our large installed UPS base, we know which UPS systems actually do deliver the best possible energy savings for our clients and their overall reliability. For a free survey or existing UPS installation assessment call us on 0800 210 0088. We can help to improve your datacentre’s energy efficiency with a legacy UPS upgrade to a high efficiency modular UPS design that will also add a further level of resilience to your facility (N+1, 2 or 3). Typical average payback based on a 50% energy usage reduction is approximately 3-4 years and we may even be able to reconfigure an existing battery to use with the new modular UPS system. 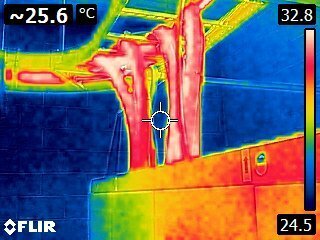 The image used in this blog post is one taken by our thermal imaging camera. Just one of the value added services we provide within our UPS maintenance contracts and site surveys.